EURUSD is under the influence of some economic reports such as Unemployment Rate, Italian Monthly Unemployment Rate, Final Manufacturing PMI and German, Italy and French Final Manufacturing in Eurozone along with the US publishing Total Vehicle Sales, ISM Manufacturing Prices, Construction Spending m/m and ISM Manufacturing PMI. 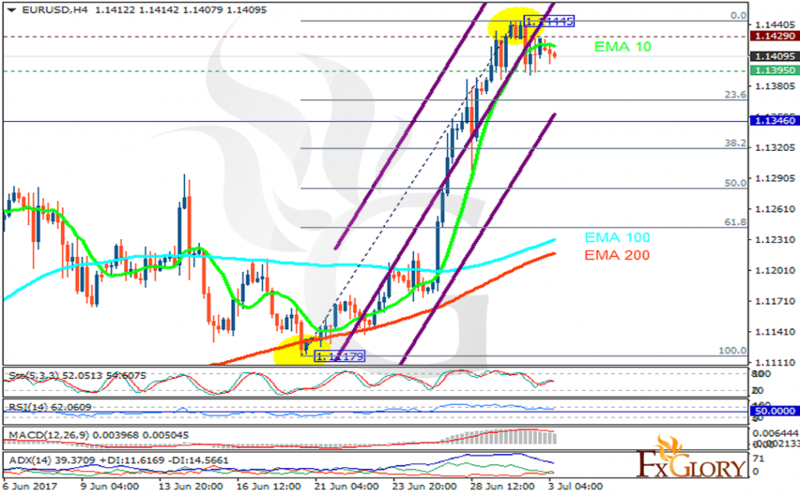 The support rests at 1.13950 with resistance at 1.14290 which both lines are above the weekly pivot point at 1.13460. The EMA of 10 is moving with bullish bias along the ascendant channel and it is above the EMA of 200 and the EMA of 100. The RSI is falling towards the 50 level, the Stochastic is showing downward momentum and the MACD indicator is in positive territory. The ADX is not showing any clear signals. It seems that bears are taking the control of the chart leading the price towards the 61.8 level of Fibonacci retracement.